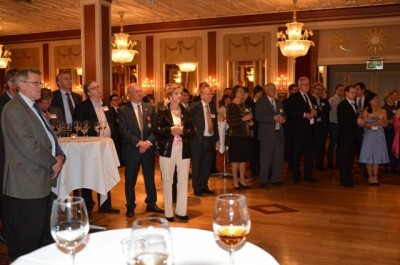 Autumn is high season for diplomatic gatherings in Oslo, when local embassies host receptions or celebrate national holidays. One country is almost always left out, at other times of the year as well, but this week it held its own party once again and some “friends” from the Norwegian Parliament came with warm words of encouragement. The Republic of China (Taiwan) celebrated its 101st anniversary in Oslo on Monday as it did in many countries around the world where it has embassies or “representative offices” as opposed to “embassies.” The distinction is important, because Taiwan has full diplomatic relations with only 23 countries where they can call their missions “embassies.” Norway is not among them. Instead, Norway like many other nations keeps Taiwan at arm’s length because of the long and difficult history that resulted in both the Republic of China (ROC) on Taiwan (the island formerly known as Formosa) and the People’s Republic of China (PRC) on the mainland making claims to China. When the UN General Assembly voted in 1971 to grant the UN’s China seat to the government in Beijing, Taiwan withdrew, and has been excluded from many international organizations and relations ever since. Taiwan did become a member of the World Trade Organisation (WTO) 10 years ago, but otherwise the exclusion has continued even though Taiwan in the intervening years has evolved into a strong democracy that conducts free and fair elections, stresses human rights and freedom of expression and also has developed a strong economy. While the People’s Republic of China is often criticized for its lack of democracy, crackdowns on personal freedom and abuse of human rights (most famously, perhaps, when the Norwegian Nobel Committee awarded the Nobel Peace Prize to one of China’s leading dissidents Liu Xiaobo), the Republic of China seems to do everything that other democracies like Norway praise and want, without getting any credit for it. The official recognition that Taiwan so badly wants and, many argue, deserves remains elusive. “It’s a very frustrating situation,” Victor Te-sun Yu, Taiwan’s official “representative” in Norway, admitted to newsinenglish.no. Yu, who spoke at length of Taiwan’s achievements at Monday’s celebration, would be considered Taiwan’s “ambassador” to Norway if it weren’t for all the politics and formalities involved. Instead, as Finance Minister Sigbjørn Johnsen wrote in a response to a question from a Member of Parliament in 2010, “representatives from Taiwan do not have diplomat status” and therefore are not granted the rights and privileges other diplomats have. “This is because Taiwan is not recognized by Norway and that only the People’s Republic is viewed as the legal representative of China,” Johnsen wrote. Former Foreign Minister Jonas Gahr Støre has said that Taiwan does not have status as its own state, and rather is viewed as part of China. 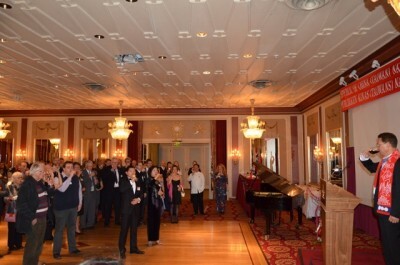 Trond Helleland, a member of the Norwegian Parliament from the Conservative Party, picked up on the irony of Taiwan’s exclusion, however, during a short speech he delivered on behalf of a parliamentary committee that supports Taiwan at the 101st anniversary party at the Grand Hotel in Oslo Monday evening. Helland, whose party looks poised to win or possibly share government power with the Progress Party or other non-socialist parties after next year’s national election, also noted, as has Yu, that relations between Taiwan and the authorities in Beijing have improved dramatically in recent years. The so-called “Cross-Straits” agreement of 2008 has led to a boom in business relations and, not least, flights between Taiwan and mainland China. They include Morten Høglund of the Progress Party, the leader of which, Siv Jensen, sent her congratulations to Monday night’s party. Politicians from Norway’s Liberal Party (Venstre) have also been frequent guests at Taiwan’s receptions. But relations between Taiwan and Norway didn’t “expand” when the Conservatives held government power either (a trade office that Norway had in Taiwan was actually closed in 2004, when the Conservatives were part of a government coalition) and there were no representatives from any of the government parties at Monday evening’s party. Yu worries the situation in Norway has worsened since the authorities in Beijing got so angry over the Nobel Peace Prize to Liu in 2010 and blamed the Norwegian government. Even though the government has nothing to do with Nobel Committee decisions, diplomatic relations between Oslo and Beijing remain frozen. Now, Yu fears, “Norway is still afraid of angering China,” and thus keeps even more distance from Taiwan now than a few years ago. He also thinks Norway “can relax a bit,” pointing to the improved relations between Taiwan and the mainland: “Our political issues are not resolved but we have agreed to disagree and are concentrating on economic, cultural and social exchanges. We cooperate, we do business together.” He doesn’t think the Chinese authorities in Beijing would be “unhappy” if Norway and Taiwan had closer relations. “The fact is, we are doing business with the world, so why should Norway worry?” Yu said.